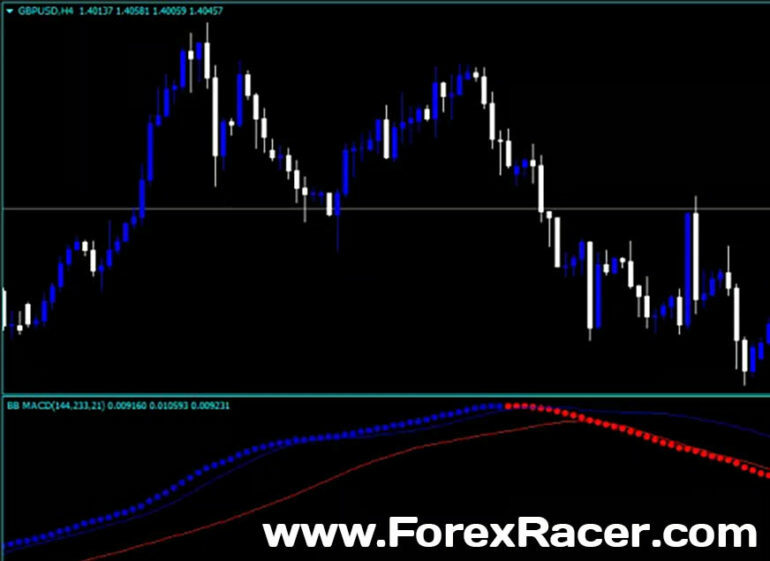 Bollinger Bands MACD CCT is a forex trading indicator created for the metatrader 4 platform. The Bollinger Bands MACD CCT is a quite simple technical indicator. This indicator shows a line made of dots which upon color change gives buy or sell signals. The Bollinger Bands MACD CCT can be used for scalping in lower time frames like 5 minute, 15 minutes, and 30 minutes while it can also be sucessfuly used to trade in higher time frames like hourly, 4 hours, and daily time frames. You can trade with the help of this indicator alone. There is no need of addational indicators. First, check the trend of the market. If the recognised trend of the market is up, then you should only open buy signals generated by the indicator. Never trade against the trend, remember? The Bollinger Bands MACD CCT has two lines in the indicator window below the main chart. The red and blue moving average remain the same through out the day, while the dotted line changes color, it becomes blue when bullish and red when bearish. When considering a buy, make sure the trend is bullish. When considering a sell, make sure the trend is bearish. The BB MACD CCT indicates bullish market when the moving average is below dotted line. The BB MACD CTT indicates bearish market when the moving average is above dotted line. Note that all signals are temporal because the market is in motion. Place your buy order at your support and place stop below the signal bar. Place your sell order a your resistance and place stop above the signal bar.